Keara walks down the aisle after graduation. This is a post that has been begging to be written for weeks now, but it’s something I’ve been putting off, perhaps because writing about it makes it far too real. 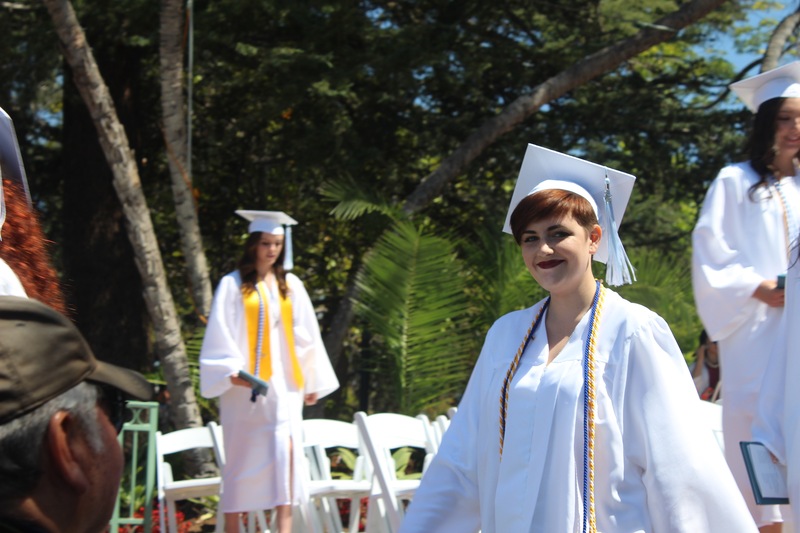 Two weeks ago today, my sweet Kiko, known to the world as Keara Moses Kirkpatrick, graduated from The Academy of Our Lady of Peace. In just over two months, she will be going away to college. As individuals and as a family, we are in a time of transition. There is joy and sadness, eagerness and anxiety, hope and nostalgia for all that has been and all that will be. We attended a beautiful ceremony at her school, but I am a big believer in rituals, so we couldn’t leave it at that. While both ceremonies and rituals use words and actions to mark the significant events in our lives, they operate on different plains. Ceremonies signify the outer experience; they are the stuff of photo opportunities and awards, for public consumption on a large scale. Rituals take place in more intimate spaces, sometimes with no more than one, or two present. Ideally, they speak to the interior processes that the ceremony celebrates. Rituals can be sacramental, in the broadest sense of the word: personal, grace-filled moments that transcend our every day experiences. Ceremonies can be organized by anyone; rituals are best experienced by those we love. One of my favorite rituals is to write my kids letters, annually on Holy Thursday, but also for significant events in their lives. It offers me an opportunity to look back at what they’ve done and who they’ve been, as well as dream about who are they are becoming and what they might do. Sharing those letters with my kids, out loud and sometimes in the presence of others, is always a sacred experience. In case they had forgotten in the course of their daily lives, they are reminded of the power and possibility of their own story. At Keara’s graduation party, with our family and close friends gathered around us, I toasted her with the following speech. I am posting it here, not only to share my own pride and joy, but also perhaps to inspire you to find a way to “ritualize” the next milestone in the life of someone you love. You don’t need to worry about being particularly eloquent, or using a lot of words. They don’t even have to be your own. Your favorite poet, or songwriter might know just what to say. If you’re nervous, allow them to do so. The important thing is to find some special way to connect what has occurred on the outside with what is happening on the inside. An expression of your Love and perspective may be the very thing that propels them forward with greater joy, confidence and determination. A couple weeks ago, Keara went on retreat with her senior class at OLP and they asked her parents to write her a letter. I thought today might be a perfect day to share some of my thoughts from that letter with all of you, her family and friends, who love and support her and have watched her grow over the years. While I was writing the letter, I was listening to “Never Grow Up” by Taylor Swift and reminiscing about all the stages and ages she’s been through over the last eighteen years. She is on the verge of going to college, moving out on her own, for a while at least, and maybe forever. The first age Swift talks about is infanthood, with “your little hands wrapped around my finger…” I still remember those days, when I held her in my arms ALL THE TIME. She was only happy being held in my arms or Tim’s, and even then not always. But she quickly became a happy baby, big smiles, big love all around. As all of you know, Keara was a priceless gift to me – my daughter, the one I got to keep and raise and hold and love and dress and play with. Keara, even though I had your dad, until I became your mom, there was a little bit of an emptiness in me. But your presence filled me up and gave my life more meaning and purpose and great, great joy. Though the teeniest part of me sang along with Ms. Swift, I’ve never clung to the chorus, or the meaning of her song with you, or Finn, or Molly. Even when you were just toddling around, I couldn’t wait to see who you would become and what you would do with your life. The possibility of you has always been endlessly fascinating to me. You have become all I hoped for and more. In elementary school, it became clear how smart you were, how disciplined, how engaged, how fun-loving. Your teachers all loved you and you had good friends. Some of them moved away and some friendships faded and my heart broke a little to see your confusion and sadness at the loss of relationships you had invested in. You didn’t want to talk about it, but I knew and tried to support you with love and encouragement. And you always managed to find new friendships that were even better, because you have such a good heart, imagination and willingness to engage with people. When you went to middle school, I watched you step into your individuality even more, or at least try to find it. Like T Swift, I would have liked to say to you, “Don’t lose the way that you dance around in your pjs getting ready for school.” You did lose it for a little bit, but through the last four years of high school, that joyful, funny, smart, playful soul has resurfaced and you will dance around in your pjs (or anything else), at any time of day or night. It makes me so happy when I see the little girl you once were, in your smile and laughter as you move. I wish that I could say that, like Ms. Swift claims that “No one’s ever burned you; Nothing’s ever left you scarred,” but I know that’s not true. I’ve seen you hurt, but I’ve also seen you rise again, every time. You know how to cry, but you also know how to start over. You know how to pick yourself up, put on your lipstick (the feminine sword and shield) and go back out there to be an even stronger, more resilient, and confident woman. I hope I’ve earned your trust and that you will allow me to stand by you forever, as your mother and as the woman who loves you most in the world, as someone who will always encourage you and lift you up in Love. I will always, we, this family, will always, always, always lift you up in Love. We will always be loyal to Keara Moses, who we fell in love with before she was born and will love beyond this life. Let me just say that these lists are incomplete, for your life is only beginning. The first eighteen years of life are formative and fun and filled with memories that shape who you will become. But the next sixty and seventy years ahead are also those things. Life is incredible raw material for meaning, purpose, passion and happiness and I’ve seen what you do with raw materials: You create beauty! It’s unique, a little dark around the edges, but fantastically powerful. You’ve done it in all sorts of mediums and so I have total confidence that you will do it with your very self and the life you’ve been given. Take your memories with you throughout life Keara and I hope they are more good than bad, but don’t look back with longing or regret. Your future holds so much promise and joy. I could not be prouder of the daughter we’ve raised and I know you will continue to do great work. We believe in you and are here for you, always. In this time of graduations and weddings, “Cheers!” says something, but your Love can say a lot more. Don’t be afraid to speak up. We need to. We assume our loved ones know how we feel about them, but they don’t, not really, unless we told them yesterday. All of us, not just our children, long to be seen, in our joy and pain, to have our triumphs applauded and our struggles encouraged. A kiss on the cheek, a hug on the way out the door, a mumbled, “I love you,” can’t possibly communicate the depth of our feelings for the complex, beautiful people we live with and among. So when the next occasion arises, or perhaps for no occasion at all, find a way to say more than comes easily and make the moment a sacred one. Posted in Family life, Parenting and tagged as Academy, graduation, high school, Never Grow Up, OLP, Our Lady of Peace, ritual, Swift, Taylor, tradition. I loved reading this. What a gift that you gave her Ali… I love letting your loved ones know exactly how you feel. Congrats to Keara and to you all. This summer will be a HUGE adjustment for your family, and I will tell you a very emotional one. We had a very difficult fall but as life goes one, we came to terms with Olson being gone and our family adjusted to its new unit. I will say when he is able to come home, we do all slide very nicely back into place and feeling complete again. Spread your wings Keara, off you GO! How lucky you are to have this amazing, loving, family unit behind YOU! Go FLY and God Bless! Thanks for the encouragement, Missy. You are just a year beyond, so I know you’re giving me hard earned wisdom and I appreciate it. It will be a big adjustment, but good for all of us, I’m sure. So beautiful and heartfelt! I know she will treasure this letter and your family’s forever love and support. I also try to make sure to tell my boys how much they mean to me, although less eloquently, and I plan on continuing this ritual, both informally and formally. Thank you for sharing (I have looked forward to reading this since we talked about your intentions) and for helping me put my feelings into words for my own loved ones. Beautifully written Ali. All the luck in the world as Keara heads out into her future! Thanks Mo! You’ve known her since she was just a little one toddling around. I will pass along the good wishes! You have such a wonderful gift of verse!I so enjoyed this beautiful tribute to Keara! Your family has always had a special place in my heart! Thank you Charene for your continual support of our family, that began when Tim was just a young man. You have no idea what an impact you had!